“I’m simply delighted to welcome you to Scotland for what is going to be a most busy and delightfully unusual experience. If you can try to be in the right place at the right time, it will help the smooth running for the next two days.” So read the welcome note, the golden ticket, I held in my hands, standing in my room at the Blysthwood Square Hotel in Glasgow on the crisp morning of my twenty-sixth birthday. 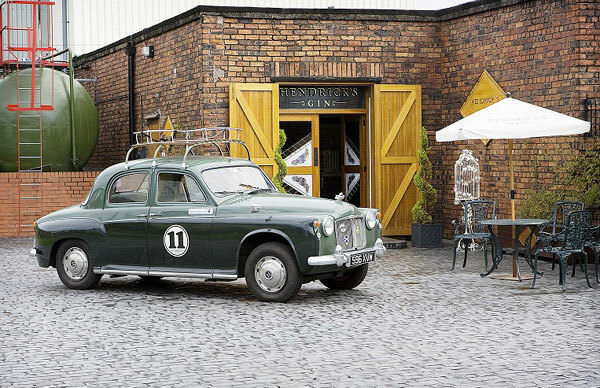 Hendrick’s Gin was creaking open the doors to its fabled gin palace in Girvan, Ayrshire, and I was one of the lucky few invited in. We were to meet Lesley Gracie, master distiller, a former chemist and one of only four people in the world who know the recipe for Hendrick’s Gin. We would get a whiff of the secrets and substances that go into those dark brown apothecary bottles. But, not immediately. There were tasks and challenges to get through first. I looked at the agenda. Tomorrow, the distillery. Today, get your sensible shoes on, we’re travelling to Braehead for a spot of curling. Curling? Yes, the sport with the ice and the brushes and the shouting. I wish I could tell you more about it, using all the technical language, but quite honestly, the whole thing’s a blur, as is most of the trip, given that there was a tray of fresh gin cocktails presented to us at every turn, for two days. I do remember having to choose a hat to wear, from several strewn across a table. And I remember being put in a team, and then getting very cold for a couple of hours, sort of learning the rules of play but mainly just chatting and looking forward to whatever drink we were going to taste whenever the game came to an end. And I was not disappointed. Hot Hendrick’s Gin punch was served in teacups by the very friendly Duncan McRae, UK brand ambassador. Magic Duncan, as I have come to think of him. He’s always there waiting for you before you even know where you’re going and why. And he’s always ladling some sort of gorgeous cocktail into a glass or teacup and presenting it to you as though it’s the natural order. My perception of normal daily life has been basically ruined by this. It now seems absurd not to find Duncan mixing cocktails around every corner. I mean what barbarism is this? Ice well and truly cracked, our red-nosed little troupe travelled merrily back to Glasgow on our bus, only to get on it again a couple of hours later to be driven through dark country lanes to Pollok House for a Victorian feast choreographed by Bompas and Parr, each course matched with bespoke gin cocktails. Dare I confess, this was my first experience of jam jars as cocktail vessels. I know. Old news. Where had I been? Again, I’m ruined. Tumblers just seem so tragically obvious now. What happened at Pollok House stays at Pollok House. All I’ll say is there was a delicious eel and tench pie, a room full of jellies, a billiards tournament on a Lilliputian table, and more gin over the course of one evening than is justifiable. Late, we began to wilt, cocktails were spilt over the edges of teacups held in unsteady hands, and whispers about leaving the house were passed around. Some dozed on the bus on the way back to Blythswood Square. I looked out of the window into dark Glasgow and thought about jelly and eels and limericks. Was I awake? The next morning, I was grateful for the alarm I had made sure to set, and for a leisurely breakfast before getting back on the bus. We sat quietly around the hotel breakfast tables, crunching our toast, sipping coffee, piecing together the events of the previous night, feeling delicate but excited. This was the day. The headline act. Leslie Gracie was waiting for us at the gin palace in Girvan, firing up the stills. We just needed to get there. Girvan is on the south west coast of Scotland. Such beautiful landscape here. Ten miles away is Ailsa Craig, an island uninhabited apart from by 36,000 pairs of gannets. Hendrick’s Gin likes to think that these birds were drawn to its neighbouring island by the lovely aromas from the distillery across the water. I like to think that too. Until recently Ailsa Craig was the source of all the curling stones in the world. That’s why we tried curling on day one. Remember day one? I barely do. Anyway, the landscape around Girvan is gorgeous and interesting, and travelling through it helps put the gin in context. 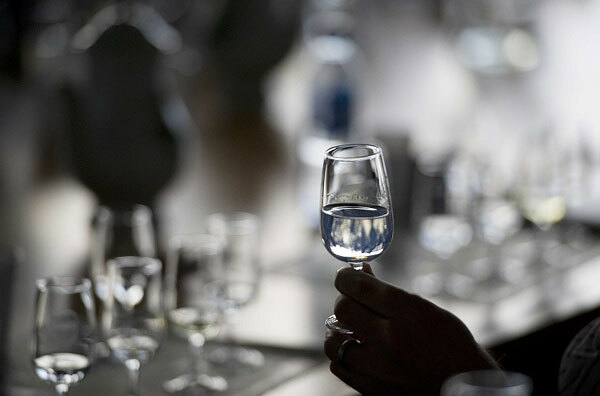 The soft lowland water from the Penwhapple reservoir provides the ideal base for the grain spirit and the botanicals. Great word, Penwhapple…Are we nearly there yet? Yes. The big factory gates opened to let us in, and in we went. 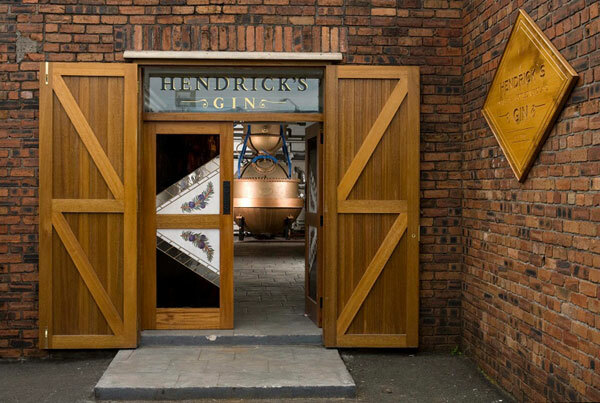 And if I was a little daunted by the colossal, towering stills of the William Grant & Sons distillery, I was immediately comforted by the sight of Hendrick’s Gin’s humble quarters, a garden shed almost, with an elegant little wrought iron table and chairs set out in front of it. It looked like Grant’s naughty little sister, lurking in the corner. Totally appropriate for a gin crafted in teeny tiny, exclusive batches of 450 litres at a time. It’s obvious as soon as you step inside that something unusual is afoot. The gentle, floral aroma wrapping around me like a grandmother’s arms, I wandered around the sweet little room, taking in the large containers of botanicals lining the walls. We quickly gathered around the long table in the middle of the room to hear as many secrets as the master distiller was prepared to tell us. Notebooks and noses poised, we learned first about the botanicals. Hendrick’s Gin is made with 11 botanicals, in an arrangement Lesley Gracie keeps a closely guarded secret. These are coriander, juniper berries, Angelica root, Orris root, lemon peel, chamomile, cubeb berries, orange peel, elderflower, yarrow and caraway seeds. We passed around bowls of the botanicals and Lesley encouraged us to crush them between our fingers to release the aromas. 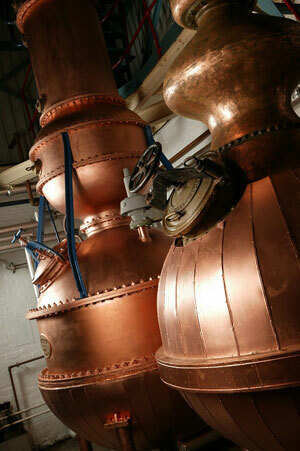 We then had a chance to help pack the orange peel into baskets that would be fed up to two magisterial old stills. Hendrick’s Gin is the only gin that uses a blend of distillates from two stills, a Carter-Head and a Bennett still. The Bennett boils the botanicals to create a spirit with a deep flavour, while the Carter-Head bathes the botanicals in vapour, which means the flavours in the spirit are more subtle. Balancing the two intensities is a trick that only those select few, including Lesley, know how to do. 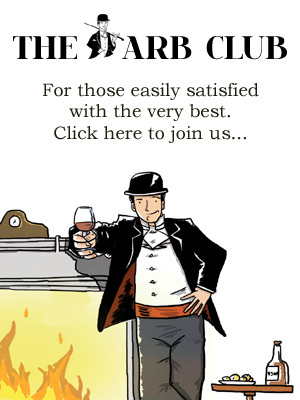 I might have a golden ticket to step into this room and breathe in the air of Hendrick’s, but I’ve certainly not won the right to that most exclusive of information. Just standing here in the warm glow of these functioning old copper darlings is prize enough. They had been out of use for decades, bought by Charles Gordon in 1966 and brought back to life in the late nineties when the family decided to use them to make Hendrick’s Gin. The gin palace is the perfect home for them. And, arguably, for me. But, of course, the ingredients that really make Hendrick’s Gin, which is classed by the European Union as a Distilled Gin, are cucumber and rose, the essences of which are infused into the spirit after distillation. Xavier Padovani, Hendrick’s Gin’s global brand ambassador (he of the cucumbermobile), took us through the process of adding these two strange but somehow completely appropriate ingredients, inviting us to taste the liquid at each step. I now understand, where before I had just felt an instinct, why it should always be served with a slice of cucumber and perhaps a garnish that draws out the rose essence. My tip? Place a cube of dusty rose-flavoured Turkish delight on each saucer next time you’re serving Hendrick’s Gin cocktails. Extraordinarily yummy with the gin. We travelled back to Blythswood, heady with botanicals, via a tipsy afternoon tea at Turnberry and a quick stop-off for a gin sorbet at the roadside while marvelling at Electric Brae, a landscape phenomenon where cars look as though they can roll uphill. And on the way home, I thought about the frame of mind I had brought with me, how it had been stretched and expanded, and how long ago the age of twenty-five seemed to be. 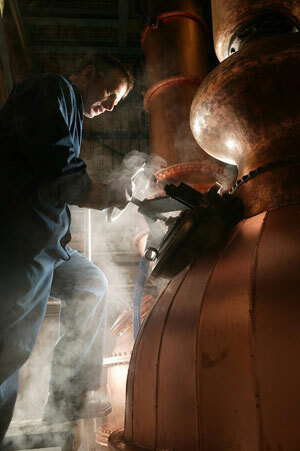 I thought about those two lovely old stills in action back in Girvan, and the floral aromas drifting across the sea. And I wondered if those 36,000 pairs of gannets would be prepared to let me join them on Ailsa Craig.